Students from Greek Life organizations entertained the residents of Brewster Village with music and conversation. To provide a fun evening for the residents at Brewster Village, Delta Gamma and the group Building Intergenerational Relationships (BIR), held the Brewster Village Formal in the Somerset Room of the Warch Campus Center on Saturday, April 28 from 4:30 p.m. until 6:30 p.m.
Brewster Village provides both a long-term nursing home environment and short-term rehabilitation depending on the needs of the resident. Many of the residents of Brewster Village do not have much opportunity to go out, so according to junior Sarah Grubbe, this formal was a rewarding experience for the residents. The residents of Brewster Village who attended were provided with transportation to Lawrence by Brewster Village, where they were greeted by members of Delta Gamma and Sigma Phi Epsilon. Sigma Phi Epsilon had created boutonnieres for the residents, and Delta Gamma decorated Somerset with an “Under the Sea” theme “that the residents really loved,” said Grubbe. Delta Gamma and other volunteers from Greek Life provided the attendees with dinner, music and conversation throughout the evening. Delta Gamma members junior Jessica Gehring, Lia Eldridge, junior Natalie Galster-Manz, and Amanda Milne performed a quartet, and the Appletones also held a private performance for the Brewster Village Formal. The event was a rewarding experience for both the residents of Brewster Village and the students who helped run the formal. 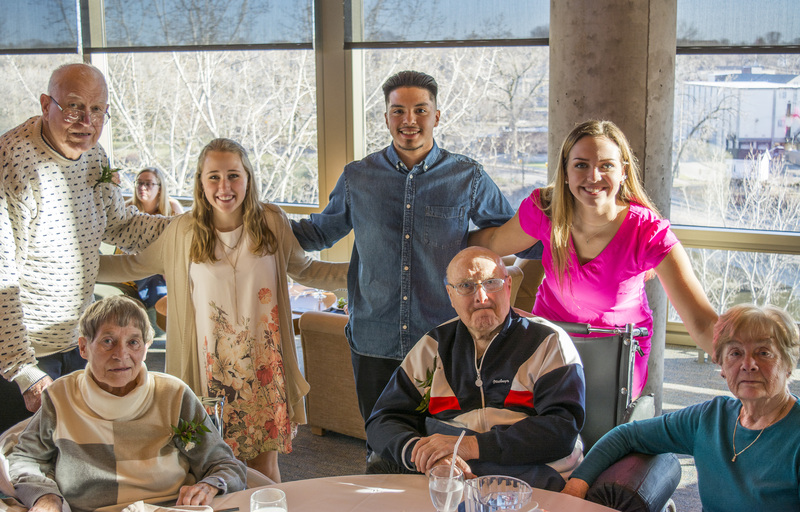 The students “enjoyed the evening along with the residents – they listened together, they ate together and they got to know each other,” said Grubbe. The event allowed residents and students to connect with each other, letting the residents experience some of the social life at Lawrence that students “so often take for granted” stated Grubbe. While this event was mostly to benefit the residents of Brewster Village, the formal also provided an opportunity for Lawrence students to take a break from their busy lives and invest some time making fulfilling connections with the residents. This event is been hosted annually by Delta Gamma because many of the members have enjoyed volunteering at Brewster Village. Delta Gamma’s next fundraising event, Anchor Splash will be held on Wednesday, May 16 from 5 p.m. to 10 p.m. in the Buchanan Kiewit Wellness Center pool. The event raises money for Delta Gamma’s independent foundation “Service for Sight.” Anchor Splash involves various swimming competitions between different Greek Life groups and some non-Greek organizations on campus.